What is the goal of arts development? Calgary Arts Development’s mission is to support and strengthen the arts to benefit all Calgarians. Creativity is an important currency in today’s world, cultural vitality is essential in building shared prosperity, and art infusing the lives of Calgarians has the power to make our city a better place for everyone. There are many people who share a belief that arts in everyday life helps build connection and vibrancy in our city. Ask parents whose children and teenagers are energized by dancing, drawing, writing, playing music, making films, acting and so much more. Ask social service agencies who use the arts to heal and empower vulnerable people. Ask businesses that want to recruit top talent from around the world about the importance of a vibrant arts scene to attract and retain these people. Ask teachers about the power of the arts to build confidence, teamwork and creative minds. And ask the many artists in our city, whose creative work makes lasting personal impressions and contributes to a vital, prosperous and connected city. We asked all of these groups, as part of the 21-month consultation process that led to Living a Creative Life: An Arts Development Strategy for Calgary. Launched in March 2014, the strategy envisions Calgary as a place that empowers every resident to live a creative life. In less than a year, the strategy attracted more than 100 signatories from a range of sectors, including arts and arts service organizations, civic partners and funders, community and social service agencies, and educational organizations. Living a Creative Life is an arts development strategy for Calgary, by Calgarians—and more and more Calgarians are getting involved. Remember that ‘the arts’ are not only large-scale shows in theatres and concert halls; they are also your favourite band, your salsa class, that mural you pass on your commute, the movies you watch with your kids and the novels you read to unwind. Celebrating and supporting all of these artistic experiences helps lead Calgary to become a creative, connected city through the arts. For a city to thrive, it needs a healthy arts ecosystem, from individual artists and grassroots companies to community-led marching bands and dance schools, and our largest cornerstone institutions. We invest in operational funding for organizations (Operating Grant Program), support for artists’ professional development (Artist Opportunity Grant Program), arts development activities such as Living a Creative Life, and project support through the crowdfunding platform InvestYYC. We also understand the deep need for investing in the future of the arts community, especially during these rapidly changing times. This is about providing opportunities to build capacity in the sector through programs like New Pathways for the Arts or the Remarkable Experience Accelerator, and it’s also about tapping into Calgarians’ enthusiasm for the arts at events like the Mayor’s Lunch for Arts Champions and the Creative Calgary Congress. 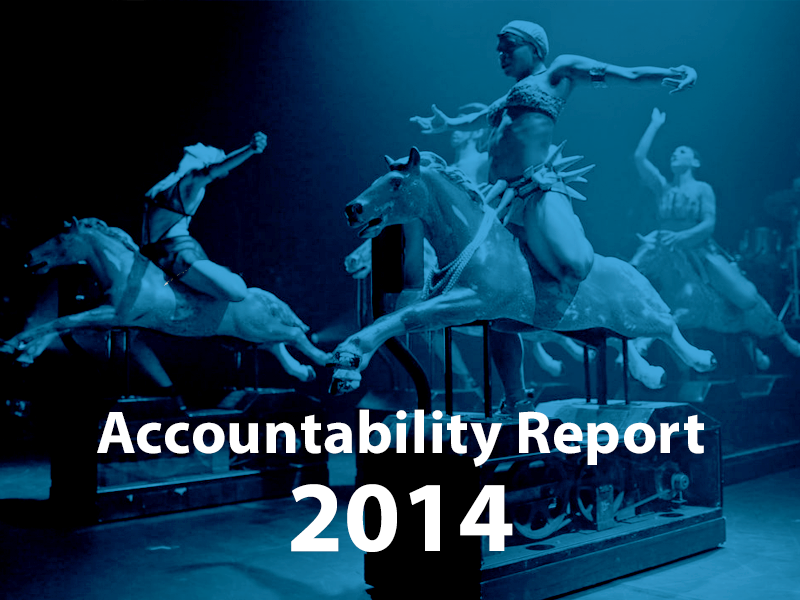 This year’s Accountability Report details Calgary Arts Development’s programs and investments in 2014. While we are proud of what we were able to contribute, we also know that the arts ecosystem is much larger than we can reach and that Calgary’s creative energy is greater than what is reflected in our programs. We invite you to visit ArtsAction.ca, which will launch on June 19, 2015. 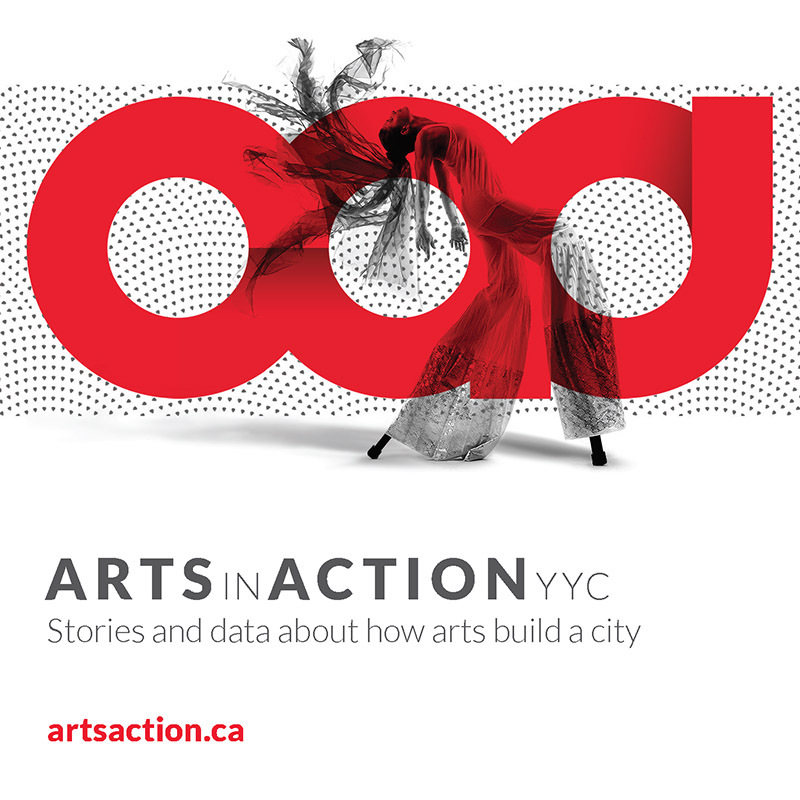 This is our first-ever Arts in Action YYC report, which shares facts and stories about the diversity and impact of the arts in Calgary—and we’re confident that you won’t have to think back too far to find a story of your own. As the city’s designated arts development authority, Calgary Arts Development supports and strengthens the arts to benefit all Calgarians. We invest and allocate municipal funding for the arts provided by The City of Calgary and leverage these funds to provide additional resources to the arts sector. Our Why: We believe that art infusing the lives of Calgarians has the power to build our city. Our Vision: A creative, connected Calgary through the arts. Our Mission: We support and strengthen the arts to benefit all Calgarians. A connector, facilitator and collaborator. A champion, supporter and amplifier. An investor in artists and arts organizations. In 2014, Calgary Arts Development finalized its 2015 to 2018 Strategic Plan. Raise Value: Calgary Arts Development continues its leadership role in the arts and with other stakeholders to make the arts integral to the lives of Calgarians. Build Relationships: Calgary Arts Development fosters collaborative relationships across sectors and communities to help ensure that Calgarians can experience art in their everyday lives. Increase Resources: Calgary Arts Development identifies ways to increase and sustain our finances and expertise, and use these resources wisely for greater impact. Overall, the 2015 to 2018 Strategic Plan aligns with four out of five City priorities in The City of Calgary’s Action Plan (A Prosperous City, A City of Inspiring Neighbourhoods, A Healthy & Green City, and A Well-Run City), and is explicitly aligned to Living a Creative Life: an Arts Development Strategy for Calgary. Calgary Arts Development’s complete strategic plan is available here. In line with the 2004 Calgary Civic Arts Policy, Calgary Arts Development is responsible for establishing arts investment programs for capital projects, organizations’ annual operations, individual artists and other purposes that achieve our strategic objectives and build strength in Calgary’s arts sector. In total, Calgary Arts Development invested $4,231,684 through these programs in 2014, a marginal increase over 2013. More information about Calgary Arts Development’s investment programs can be found at calgaryartsdevelopment.com. This program invests in professional development for individual professional artists, covering expenses related to a unique professional opportunity to a maximum of $2,500. Although the grants are modest, the impact has been transformational. With no set deadlines for applications in 2014, the program allowed artists to take advantage of short-term opportunities to develop their careers. Since its inception in 2013, demand for the Artist Opportunity Grant has grown rapidly. The program continues in 2015. More information can be found here. Calgary Arts Development piloted the Arts for All Program in 2013 and 2014 to invest in arts activity outside of the downtown core, focused on East Calgary during the pilot period. The first community to host this program was Greater Forest Lawn (Forest Lawn, Forest Heights, Penbrooke Meadows, Erin Woods, Albert Park, Dover and Southview). Calgary Arts Development partnered with the International Avenue Business Revitalization Zone (BRZ) to engage a range of artists and arts organizations in the area, as well as local businesses and community members. Calgary Arts Development and the International Avenue BRZ have continued our partnership on artBOX on 17E, a 3,300-square-foot temporary presentation, production, performance, meeting and workshop space for the arts, located at 1807 42nd Ave. SE. Calgary Arts Development contributed $60,000 towards the space in 2014. The Greater Forest Lawn Artist Award, a $5,000 award intended to support at least two months of living expenses for the recipient to devote concentrated time to artistic work, went to visual artist Deng Duot. Developed as a legacy project of Calgary’s year as a Cultural Capital of Canada in 2012, investyyc.com is a crowdfunding website exclusively for Calgary-based artists and arts organizations to raise funds, find volunteers and generate awareness. Applicants receive personalized support from Calgary Arts Development while they develop their project pages and crowdfunding plans. Project organizers also have access to crowdfunding training and best practices. InvestYYC allows projects to provide tax receipts to cash donors through the Canadian Online Giving Foundation. More information is available at investyyc.com. New Pathways for the Arts is a three-year program delivered by EmcArts, a New York-based social enterprise for learning and innovation in the arts. The program develops a learning community of not-for-profit organizations that undertake artistic work. Once formed, the learning community advances its organizational innovation and adaptive capacity through a series of workshops, coaching sessions and forums. The New Pathways program for Calgary is a carefully crafted local response to the specific and urgent needs of participating creative organizations, building greater capacity for innovation and helping develop resiliency in changing times. Calgary Arts Development is contributing $200,000 over three years towards the total program cost of $750,000. Thank you to the Alberta Foundation for the Arts, the Calgary Foundation and Suncor Energy Foundation, who are co-investing in New Pathways as program partners. New Pathways for the Arts is also being delivered in Edmonton with support from the Edmonton Arts Council, the Edmonton Community Foundation and the Alberta Foundation for the Arts, making Calgary and Edmonton the first Canadian cities to participate in the program. New Pathways programs have been successfully implemented in many cities across the United States, including Chicago, Cincinnati, Cleveland, Denver, New Haven, New York City, St. Louis and San Jose. In addition to the organizations participating in the New Pathways program, EmcArts runs a ‘Train-the-Trainer’ program that immerses and prepares a selection of local consultants and service providers to deliver adaptive coaching work in the future. EmcArts staff will conduct a series of free coaching sessions with the local consultants—New Pathways Fellows—to orient them to the program, transfer knowledge and help build intervention skills around innovation and “next” practices in the field. 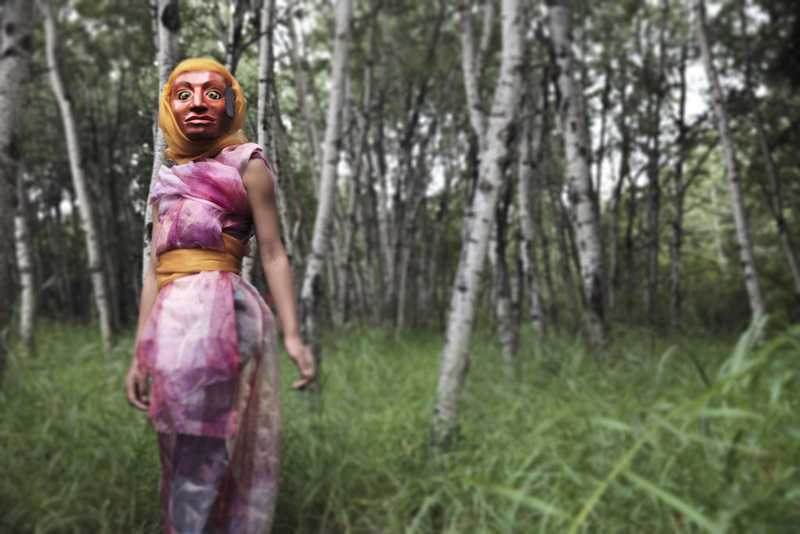 New Pathways for Arts will continue in Calgary throughout 2015. More information is available here. The Operating Grant Program invests annually in non-profit organizations with year-round, arts-driven operations, prioritizing organizations that demonstrate high artistic impact, public impact and organizational resiliency. Organizations may allocate these funds to any areas of their overall budgets. In 2014, the Operating Grant was opened to new applicants for the first time since 2011. This not only gave organizations not previously funded by the Operating Grant Program an opportunity to enter the program, but also allowed Calgary Arts Development to assess its investees in the context of Calgary’s greater arts ecosystem. Demand for the program continued to outstrip the funding pool, however, with nine new organizations funded out of 60 new applicants to the program. In 2014, Calgary Arts Development invested $3,664,750 (compared to $3,657,200 in 2013) in 155 organizations (151 in 2013). The organizations listed below produced or presented a total of 10,289 public activities for a total audience of 3,193,840. More information about the program is available at calgaryartsdevelopment.com. vibrancy of Calgary’s city centre. The program develops customized, multi-year investment strategies with arts organizations selected by an assessment panel (comprising Calgary Arts Development’s President & CEO, the Executive Director of the Calgary Hotel Association, as well as civic, business and arts leaders). A maximum of five organizations may participate at any given time. The Remarkable Experience Accelerator program has been renewed and expanded for 2015 to 2017, with a new application cycle underway. More information can be found at calgaryartsdevelopment.com. Not all needs in Calgary’s arts community fall within the parameters of existing programs, and Calgary Arts Development has historically offered assistance (when able) to organizations and individuals facing extraordinary circumstances. 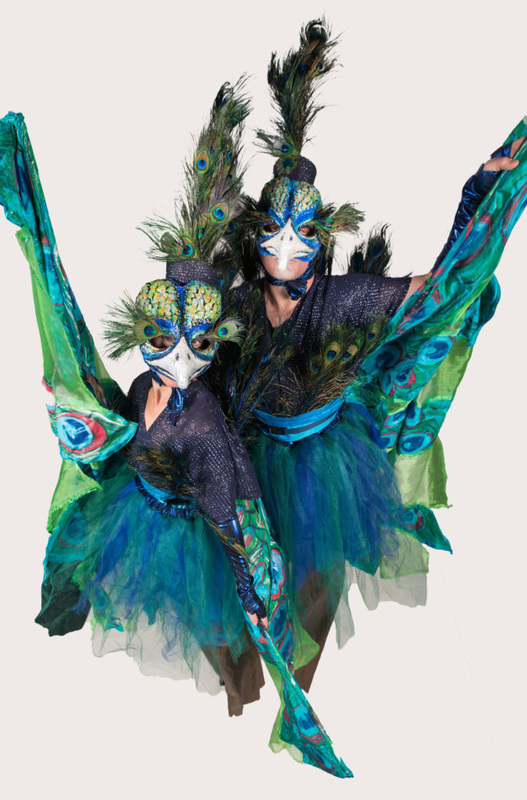 In 2014, Calgary Arts Development piloted the Special Circumstance Program to create greater structure and transparency for these special cases. The request aligned with Calgary Arts Development’s mission to support and strengthen the arts to benefit all Calgarians. The request aligned with one or more focus areas of Living a Creative Life: An Arts Development Strategy for Calgary. 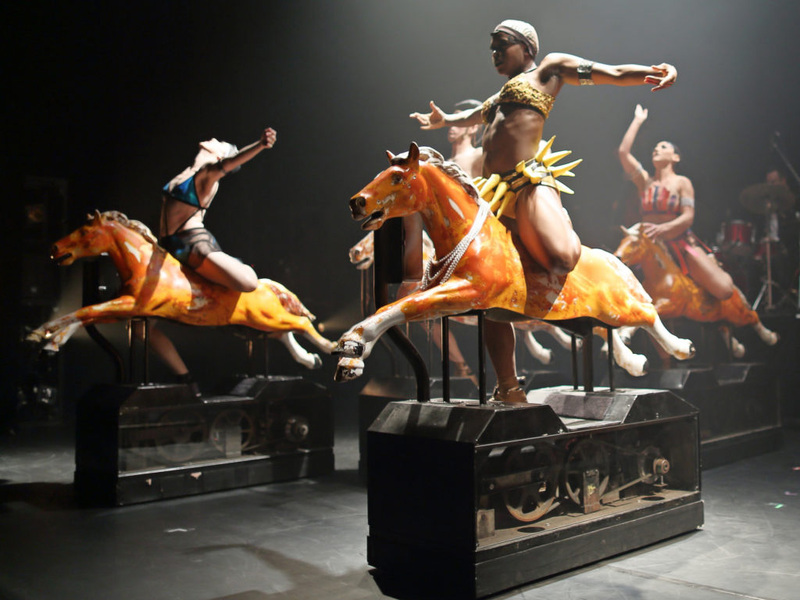 The request could not be addressed by existing Calgary Arts Development programs. The request had a significant impact on the applicant’s ability to undertake their artistic practice or organizational mandate, and/or their ability to make a significant impact on the arts sector. Resources were available and the request was under the program’s funding cap of $250,000. Investments are being finalized in 2015 for Contemporary Calgary, Making Treaty 7 and TRUCK. Due to the sensitive nature of the program, Calgary Arts Development chooses to keep the precise circumstances funded confidential. Funds for these organizations will come from Calgary Arts Development’s 2015 budget because of the program’s timing. After completing the Special Circumstances Program pilot, Calgary Arts Development determined that the program design did not achieve its goal of responding quickly and adequately to truly exceptional circumstances, and the program will therefore be discontinued in 2015. Calgary Arts Development will continue to assist Calgary’s arts community and do our utmost to find ways to respond to extraordinary occurrences as they arise within our community. Our engagement programs build momentum for the future by raising the value of the arts among all Calgarians, giving greater meaning and value to our direct investment in Calgary’s arts community. Living a Creative Life: An Arts Development Strategy for Calgary was finalized in January 2014, with the complete publication released in early March. Living a Creative Life (formerly Arts Plan) emerged from close to two years of rigorous consultation and is a result of our year as a Cultural Capital of Canada. Living a Creative Life also launched a monthly newsletter and a Twitter handle, @yycLCL, in 2014. Tactics that contribute to achieving the goals of each focus area. A list of signatories that have committed to aligning with some or all of the strategy’s focus areas. Success indicators and measurements for each focus area. Tactical plans will be reviewed annually with Living a Creative Life signatories and stakeholders, and updated as needed. Endorsers are individuals or organizations that endorse the overall vision and focus areas of Living a Creative Life and believe that the arts contribute to a Calgary they want to live in. Endorsers make no formal commitment to the strategy other than personally striving to live a creative life and encouraging other Calgarians to do the same. Anyone can endorse Living a Creative Life at livingcreative.ca. Signatories are groups or organizations that will contribute to one or more tactics outlined in Living a Creative Life and agree to consider the strategy’s overall framework during their own strategic planning. Signatories will also participate in shared measurement activities so that the progress of the strategy’s goals can be tracked. Signatories make a formal declaration of their support via a signed document that outlines their commitments to Living a Creative Life’s vision. Ongoing tracking and annual reporting on the progress made towards the outcomes of Living a Creative Life. Analyzing data collected from signatories and other sources. Continuing to engage endorsers and signatories to Living a Creative Life. Living a Creative Life had more than 100 signatories as of December 2014, representing a range of groups including arts organizations, civic partners, provincial arts service organizations and private sector businesses. Calgary Arts Development will continue to engage signatories throughout the life of the strategy. Living a Creative Life includes success indicators for each focus area so that progress towards the strategy’s outcomes can be tracked. These success indicators are systems-level measurements that will be evaluated annually. In November 2014, Calgary Arts Development released the Success Indicator Baseline Report, which provides baseline data for each indicator using the most complete information available at the time. Future success indicator reports will compare their measurements against these baselines. More information about Living a Creative Life is available at livingcreative.ca. Calgary Arts Development produced the first Arts Champions Congress in 2011 as a meeting place for people who make Calgary’s arts sector a vibrant and exciting place to work and our city a great place to live. 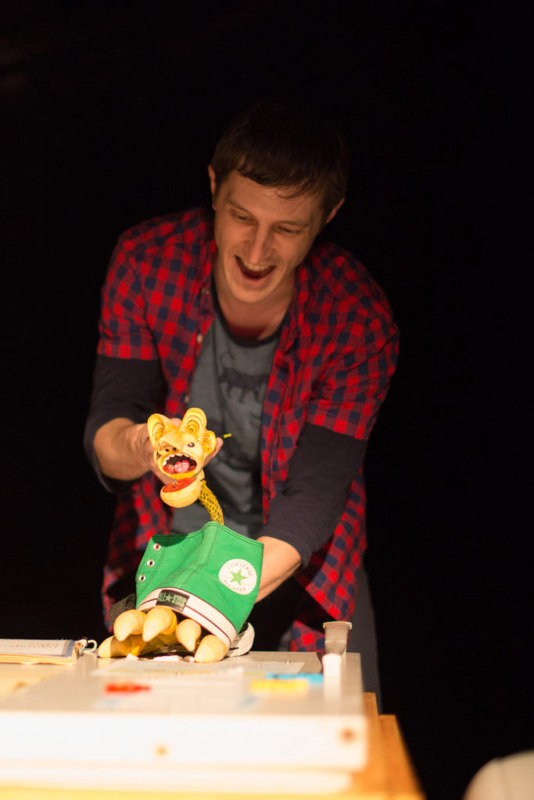 A second Arts Champions Congress was held in 2013. Renamed the Creative Calgary Congress for 2014, the annual event seeks to extend its reach to those who may not traditionally be involved in the arts, bringing like-minded people together to connect around opportunities to increase the vibrancy of our city. The 2014 Creative Calgary Congress took place on November 6, 2014, and was sold out with more than 200 attendees. The event featured keynote speaker Erik Takeshita of Minneapolis/St. Paul’s Local Initiatives Support Corporation (LISC), a leader in arts-based community development and creative placemaking. The event’s nine breakout sessions covered topics such as creative fund development, creative placemaking, citywide engagement and artist-centred learning. The Calgary Poet Laureate is an artistic ambassador for Calgary, presenting at civic events and producing literary work that reflects our city and its citizens. derek beaulieu was sworn in as Calgary’s second Poet Laureate in Council Chambers on April 28, 2014, taking over the position from outgoing laureate Kris Demeanor. As a legacy of his two years as Poet Laureate, Demeanor presented The Calgary Project: A City Map in Verse and Visual, an anthology of poetry and visual art by Calgarians about their city. beaulieu serves as Calgary’s Poet Laureate until 2016. In 2014, beaulieu participated in more than 25 events as Poet Laureate, including workshops, panel discussions, conferences, festivals, residencies and performances. The Calgary Poet Laureate program awards each Poet Laureate an annual honorarium of $10,000, funded entirely by six Calgary Poet Laureate Ambassadors (the Calgary Foundation, the Calgary Chamber, First Calgary Financial, FirstEnergy Capital, Transcanada and one anonymous donor). More information about the Calgary Poet Laureate can be found at calgaryartsdevelopment.com. The Mayor’s Lunch for Arts Champions is an annual event organized by Calgary Arts Development and the Office of the Mayor that aims to celebrate and inspire both new and veteran arts champions to support Calgary’s arts sector through investment, promotion and participation. The sold-out event was held on February 20, 2014, and attracted 680 attendees, including 68 artist table hosts. Programming included a video presentation of that year’s Cultural Leaders Legacy Artist Award recipients, a panel on the interplay between arts and business, a youth arts showcase, and comments from emcee Dave Kelly as well as His Worship Mayor Naheed Nenshi. The event also saw a significant increase in the number of tables sponsored by Calgary corporations (from two in 2013 to 11 tables in 2014). The 2014 Mayor’s Lunch for Arts Champions contributed resources to the arts sector by investing all proceeds from the event in the nine projects listed on InvestYYC.com at the time. The event raised $30,000 for InvestYYC projects, which saw three of the projects instantly reach their fundraising goals. More information is available at mayorslunch.com. 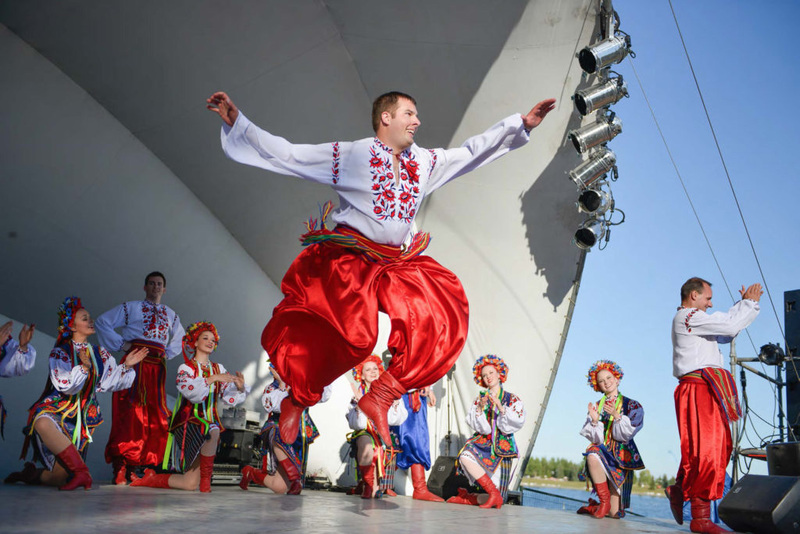 The Cultural Leaders Legacy Artist Awards offer each recipient a $5,000 cash prize, totalling $30,000 awarded to Calgary artists and organizations in 2014. Presented annually at the Mayor’s Lunch for Arts Champions, the awards are a legacy of our year as a Cultural Capital of Canada in 2012. Each award runs for four years and is funded by a $10,000 contribution from a local philanthropist or organization, with a $10,000 matching donation from Calgary 2012. 2014 was the second year for all the awards except for the ATB Financial Healing Through the Arts Award, which was presented for the first time in 2014. Access to affordable and suitable space is essential for a healthy arts community. Calgary Arts Development runs a variety of initiatives that support artists’ and arts organizations’ access to space. The Cultural Space Investment Process (CSIP) is a capital project evaluation process established by Calgary Arts Development to inform City Council and the municipality of priorities for community-led, cultural infrastructure projects. Formerly the Arts Spaces Investment Process (ASIP), CSIP has been revised to accommodate facility proposals at an advanced stage of readiness that enable a broad range of arts, culture and heritage activity throughout the city. Each year, CSIP draws on the professional expertise of a group of arm’s-length volunteer assessors to review projects and make recommendations. 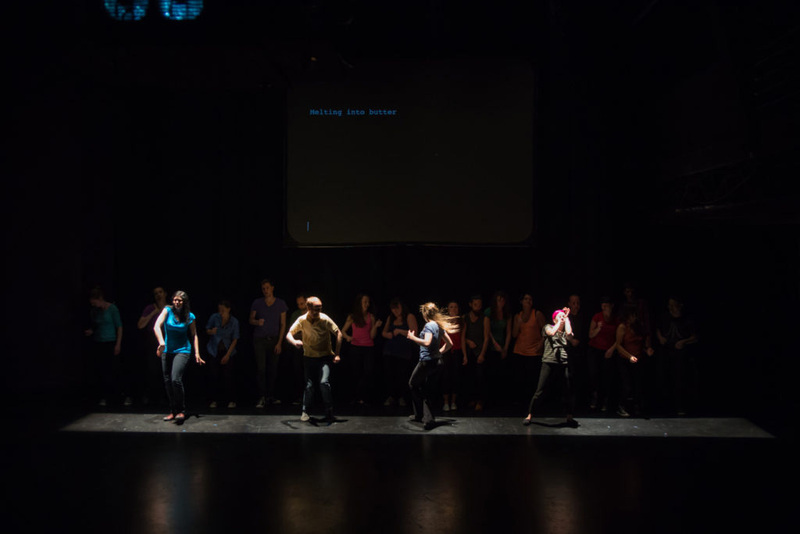 In 2014, the assessors recommended the Youth Singers of Calgary’s Performing Arts Youth Centre as a priority for funding consideration by The City of Calgary. The assessors also identified Glenbow as a significant cultural institution whose revitalization was recommended for future funding consideration. Calgary Arts Development partnered with The City of Calgary to bring together artists, arts organizations and facility operators through a free Arts Spaces Networking Night. Held on September 22, 2014, the event was designed to connect community groups and other facility operators with artists and arts organizations looking for space. The event attracted about 150 attendees and feedback was overwhelmingly positive, with many attendees requesting that similar events be held in the future. Calgary Arts Development continues to hold Arts Spaces Networking Nights periodically. More information is available here. Calgary Arts Development communicates opportunities for viewing spaces that are available to lease, purchase, rent or share. In 2014, Calgary Arts Development promoted four open houses to the arts community, ranging from sales of large commercial space to leases of small co-location space. Density incentives for arts spaces in the downtown core. Property tax mitigation for non-profit organizations with buildings under construction. Theatre and visual arts spaces in the Rocky Ridge and Seton Recreation Centres. Calgary Arts Development also advised on arts spaces in the TELUS Sky project and the Calgary Board of Education’s proposed northeast high school at the Genesis Centre. In 2011, Calgary Arts Development established cSPACE Projects in partnership with the Calgary Foundation to respond to the need for affordable and collaborative space for artists and non-profit organizations. cSPACE’s flagship project is a transformed 100-year-old sandstone building with over 47,000 square feet of creation, production, exhibition and rehearsal space. cSPACE King Edward will support dozens of small organizations and the hundreds of creators they work with. The facility is expected to open in late 2016.
cSPACE raised over $2 million in fundraising from individuals and corporations throughout 2014, topped up by an additional $1 million from the Province of Alberta. The complex municipal permitting process for cSPACE King Edward concluded in 2014, with the project’s building permit released in October. cSPACE also completed the 18-month process to find development partners in 2014, selecting two Calgary-based developers (Rockwood Custom Homes and Section23 Group) to help cSPACE complete the vision for the full city block. As an outcome of cSPACE’s work to promote the legacy of the King Edward School, it received a Community Vitalization award through the Calgary Heritage Authority’s biennial Lion Award in 2014. While some of the original tenants identified in 2012 have decided not to stay with the project, six new non-profit organizations have signed on to be long-term tenants of cSPACE King Edward. Over half the leasable space at the King Edward has been allocated. More information can be found at cspaceprojects.com. As part of its role as a communications hub and connector, Calgary Arts Development serves Calgary’s arts community and engages the public through the following. The number of events and unique visitors were consistent with 2013 levels; Twitter followers grew by almost 30% and the number of newsletter subscribers decreased significantly as subscriptions were confirmed in compliance with Canada’s Anti-Spam Legislation. More information can be found at calgaryculture.com. Calgary Arts Development hosts a robust classifieds section on calgaryartsdevelopment.com. This free service is an online venue for sharing announcements relevant to the arts sector such as job listings, volunteer opportunities, audition notices, calls for submissions, educational opportunities, industry events, items for sale or wanted, requests for proposals and notices of spaces available or wanted. These classifieds fill an important communications niche for the arts community, and about 580 ads were posted in 2014 (roughly the same as 2013) with more than 25,000 unique visitors (11% more than in 2013). Overall, the site had close to 81,000 unique visitors. Following the June 2013 Alberta floods, Calgary Arts Development convened more than 35 government and community agencies whose mandates include direct support of artists and arts organizations to form Alberta Arts Flood Rebuild. In 2014, Alberta Arts Flood Rebuild completed its second round of funding, disbursing a total of $198,500 to nine artists and eight arts organizations affected by the June 2013 Alberta floods. This round of funding followed an initial intake in fall 2013. Residual funds will be used for two legacy projects: $25,000 contributed from the Calgary Foundation will be used to create an Arts Disaster Preparedness Plan. The plan will build upon the Disaster Preparedness Plan for The City of Calgary created by Calgary Economic Development and the Calgary Chamber, as well as from the Calgary Chamber of Voluntary Organizations’ Emergency Preparedness Initiative. The Arts Disaster Preparedness Plan will include Calgary contacts and information as well as best practices, and will be shared as broadly as possible across the province and the country. The approximately $25,500 remaining in unrestricted contributions from community donors will be used to create a special fund at the Elephant Artist Relief Society (EAR) for the purpose of helping individual artists of all disciplines in crisis. Alberta Arts Flood Rebuild gratefully acknowledges the contributions from the Government of Alberta, the Alberta Foundation for the Arts, Suncor Energy Foundation, Calgary Arts Development and hundreds individual and community donors. More information is available at albertaartsrebuild.ca. Calgary Arts Development is governed by a Board of Directors, appointed by and directly accountable to its Shareholder, The City of Calgary, via City Council. The Board of Directors governs lawfully, observing the principles of the policy governance model, with an emphasis on strategic leadership and clear distinction of Board and CEO roles. The Board also identifies the principal risks of Calgary Arts Development’s business, achieves a proper balance between risks incurred and potential returns, and oversees the development of policies and the implementation of appropriate systems to manage the risks. In 2014, there were six regular board meetings and a two-day retreat scheduled, with an attendance record of 85%. The Calgary Arts Development Board of Directors carries out its responsibilities using the following committee structures. Financial information, including audited financial statements. Governance matters, including management of the relationships between the Board of Directors and the CEO and between Calgary Arts Development and the Shareholder, all as defined in the governance policy manual approved by the Board of Directors on May 20, 2009. Human resources policy development and oversight, including review of CEO performance, compensation and development. Board of Directors recruitment, development and evaluation. Considering and making recommendations to the Board of Directors on matters affecting strategy and public policy within Calgary Arts Development’s mandate. Monitoring Calgary Arts Development’s alignment with our mission and vision. Facilitation of the strategic planning process in coordination with the Board and management. A comprehensive policy exists for members of Calgary Arts Development’s Board of Directors that sets the parameters around potential conflicts of interest. Calgary Arts Development aims to recruit Board members whose professional reputations and work in the community will enhance Calgary Arts Development’s impact. These individuals have a strong commitment to building the arts in Calgary, to making the arts central to the municipal decision-making process and to building relationships with other agencies from the public and private sectors. Dean Prodan (Chair), CFO & Director, Whitehorn Resources Inc. Thank you to the many people who have given their time and expertise to our programs. We could not succeed without them. George Brookman, West Canadian Industries Group Inc.